Whether a veteran player polishing the rust off their sword or a complete neophyte stepping into the unknown, everyone requires a survival guide on how to navigate the Isle of Styss. Firstly, enabling entirely new players to hit level 40 without any outside help. Secondly, detailing the mechanics behind gems, weapons, and armor. Thirdly, creating a list of builds that people can use and learn how to make their own. Returning players may find some redundancy in the guide. Feel free to skip ahead to relevant portions for yourself. If you have any questions, message me on Discord or in game. I’m happy to help when not busy. I'm piecing the guide together slowly, so it might take some time for it to be fully functional. Please try to keep the thread clear of comments until it's properly finished. Thank you! After answering the prompt, head North to the Blackwaters Rock (Henceforth abbreviated as BWR) tent. Directly South of the spawn is an NPC named Ruranar. Speak to him and he will add a “Small Magical Chest” to your inventory. You can use the chest by either equipping to a quickslot or right-clicking and activating “Use: Unique Power” and clicking on the ground besides you. This chest allows you to sell any trinkets and loot you acquire while adventuring. Before setting out you will need to buy some mundane weapons. Head East into BWR, and then in the SW corner you will find Ironbeards Smithy. Purchase only the most basic weapons without any bonuses – you will want to save most of your gold for a haste cloak which costs 13598 gold. 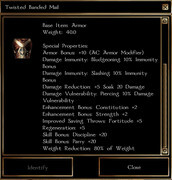 Equip your weapons and search your inventory for an “ironskin ring”. The ring gives you damage reduction which early enemies can’t deal with very well. Now, with your gear equipped, it’s time to fight some goblins! 1. Make enough gold to purchase a haste cloak. You will require 13,598 gold for this. Directions from BWR: Head West and transition into BWR West. Transition west again to Main Hunter’s Road and head west until the fork. Turn South and transition to Port Alee Darbah. Head SE into the waterfall cave towards Twisted. Head SE up the cliff and stop at the bridge. Don’t cross, go down the stairs and enter the “JoO No ENteR!! !” cave. How to: On the very first floor you will encounter weak goblins and rats. •	Rats die very quick and give more XP but do not drop loot. •	Weak goblins take a little more effort to kill, but they do drop loot. Note: you can move between transitions to respawn enemies so you don’t have to wait on the timer. In fact, this can be done with most dungeons and is critical to leveling quickly. Your first priority is acquiring enough gold to purchase a haste cloak. Kill a mix of goblins and rats, selling the items from goblin remains with your chest, until you have enough currency for said cape (13,598 gold). Once you have that amount teleport back to BWR. From there, head east to Western Lakeshore. Take Chong Wu’s ferry to the Middle of the Lake (Mystical Island of the All-Father). Head east, up the stairs to the shop. Buy a cape of speed for 14k and head back to leveling at goblin cave. Although it may seem a little awkward to backtrack for the cloak, having haste on your character will expedite your leveling exponentially. Return to the cave and continue leveling and selling loot until level 8. 1. Learn how to utilize OOC releveling. Once you hit level 8, it’s time to move on to enemies that will give you high experience rewards. You want to be receiving 2,000+ xp per kill, and The Ancient Battlefield will net you just that. The fastest way to farm the Ancient Battlefield is with judicious use of fireball spells or self-buffing as a cleric and whacking skeletons. How is your melee character going to cast fireball you ask? Easy – releveling in the OOC room. Use the teleport wand and head to the OOC room and head to the customizer alcoves on the Eastern portion of the room. 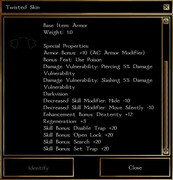 Speak to the character customizer NPC, choosing option 1 and then option 9. Now, I cannot stress this enough - learning how to relevel appropriately as a spellcaster is the key to efficient leveling and farming on Styss. Initially this may seem time consuming, but in the long haul it will save you a great deal of energy. 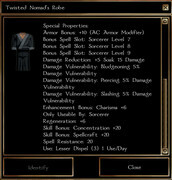 In this case, Tom’s intelligence is the highest spell ability modifier which corresponds to releveling as a wizard. In this case, Ian can either choose to relevel as a wizard or cleric since both wisdom and intelligence are his highest spell ability modifiers. In summary, choose the highest ability modifier from your base stays between Wisdom, Intelligence, and Charisma and revel as a Cleric, Wizard, or Sorcerer, respectively. Choose the hell hound as your familiar as they are immune to fire spells. You will want fireball and burning hands as spells along with anything that buffs AB/AC. The trickery domain will eventually allow you access to improved invisibility. The other domain isn’t too important, but war tends to be good for the buffing spells it gives. After releveling, return to BWR and Ironbeard’s Smithy to purchase some better gear. 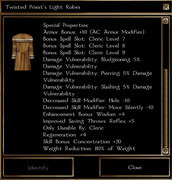 A +2 or +3 enhanced weapon should suffice, and if you’re a cleric some armor for AC. If you’re a sorcerer or wizard your best bet for AC will be Meriok’s Store of Wonders located on BWR West. His amulet, boots, and rings all offer extra AC. Ideally, you want somewhere around 30 AC to be able to engage the enemies without being hit often. An AB of 15 will make easy work of hitting the enemies. This is easily achieved for clerics. Mages may struggle getting high enough AC and AB early on. Instead, they must use their familiar to soak damage and cast spells instead. With that in mind it’s time to head to The Ancient Battlefield! Directions: From BWR by heading West to BWR West. Transition west again to Main Hunter’s Road and head west until the fork, then turn North and transition onto Main Hunter’s Road – Wooded Path. Continue North and transition to Ancient Battlefield and Cliffs. Choose the hell hound as your familiar as they are immune to fire spells. Possess your familiar to aggro the enemies, then cast fireballs and burning hands to damage the squires. You may have to finish them off with melee, or just continue casting lower level damage spells. Use bless and aid as your first buffs as they last the longest. Before engaging, cast divine power and divine favor in that order as they last the shortest. You should have a pretty decent AB/AC and can just bash the skeletons. Once the squires drop off in XP, head to the SE portion of the map into the crypts. Work your way down to the second level. Continue until you make it to level 15. 1. Utilize Undeath to Death to turbo level to 40. This is it. 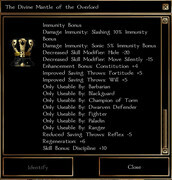 Undeath to Death is ~the~ premier leveling spell and will allow you to power through levels 15-40 with the utmost ease. Before going into why this spell is good, let’s examine the requirements for casting it. 1. Minimum ability score of 15 of Wisdom, Intelligence, or Charisma. 2. 11 Caster levels of Cleric, Wizard, or Sorcerer. So why do you want to use this spell? 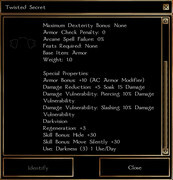 It allows you to kill multiple undead creatures instantly, often through walls and at colossal range. Once level 15, head back to OOC and relevel. 1. Feats (prioritize in this order): Spell focus: necromancy, Greater spell focus: necromancy, silent spell, empower spell, maximize spell. 2. Ability Points: All your ability points should be dumped into the corresponding ability modifier of your spellcaster class to increase the DC of the spell. B. Optimizing Undeath to Death from levels 20-40. C. How to use Undeath to Death. A slight warning: casting this spell from the regular and silent spell slot does not always affect enemies. There are times when you will have to cast it as an empowered or maximized spell to work. Regardless, simply cast the spell near enemies and watch them die. It has a massive range and targets 4 enemies at once. 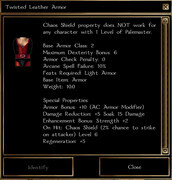 ***Note:*** If your character had low starting stats, you may need to level past 15 until you can increase your ability modifier to an acceptable level. Improved invisibility is important, as it will give you 50% concealment. Besides this, anything that boosts your AC, stat modifiers, and AB is a welcome addition. Just as before, head back to BWR and makes purchases between Ironbeard’s Smithy and Meriok’s Wonders. •	To survive against the archers, I found that having around 43 AC with improved invisibility is enough. Directions: Return to the Ancient Battlefield and continue North to the transition. Get as many Undeath to Death spells as you can, especially the metamagic, and open the gates. Walk in just enough to spawn the archers. Start casting Undeath to Death on the enemies – the range is colossal so you don’t have to be close. If the archers are giving you trouble, kill a few, run out to the transition, rest, and then re-enter. They should have spawned again and you can continue to cycle. Rest before heading in. You will immediately be met with archers, so if they were giving you trouble outside you may have to level more and increase your AC. One of the easiest ways to boost your AC is by taking a single level of monk for tumble and the AC boost from the wisdom modifier. 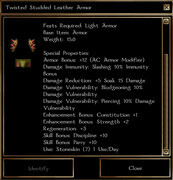 This modifier, however, is lost if wearing armor or using a shield. Once you are able to comfortably deal with archers you can continue ahead. You will find a new variety of enemy: Scythe wielding wraths. They have knockdown and can flatten you easily if you don’t have enough discipline or AC to deal with them. Try to keep your distance from these. A new enemy is introduced here, the Shadow Knights. Similar to the scythe wraiths, the Shadow Knights will use knockdown on you and have a higher AB. The final variety of enemy is the wizard ghost. They are immune to spells, and have to be dispatched through melee. Do not engage them unless you have mind blank or clarity – they can easily paralyze or confuse your character otherwise. This is the dungeon boss. I recommend not engaging until you are finished leveling. This section shows the most useful items you will find at the level 40 merchants. I've excluded a few that usually don't receive use, but you may find some that suit your build. Regardless, this will give you a very good idea on how to gear your characters. Note: Requires that you do not multiclass into Druid, Cleric, Wizard, Sorcerer, Shadowdancer, Red Dragon Disciple, or Palemaster. Additionally, strength must be higher than dexterity. All bows have protection from bigby's forceful hand as well. All ammo receives 1d4 divine, 2d4 slashing damage. This is achieved by socketing gems onto them. The amount of gems varies with every weapon. The Question (Greataxe) receives 6 socket-able slots. The Shamshir (Scimitar) receives 5 socket-able slots. Some weapons have even less (3) slots, but I don't have enough gold or gems to test all of them. Gemstones of wizard, sorcerer, druid can add levels 7-9 of desired spell slot depending on the gemstone. Check under the News section of forums for optional portrait packs. Apologies. this is a wrong account! We are still active. Msot of us chatter on Discord in real time. Just noticed IoS. Hopefully it makes a comeback.Some old players are on Arelith. Hey folks, been playing on Sinfar since IoS went down as Varus Castellan. Some of you may remember him. Ruby golem fix now posted on forums. Make the Bloodplains interesting! Hi to everyone else arriving. Tell your freinds! i need to finish my brief for friday ! oh my ! im not going to make it ! ;_; so, have fun for me, ok ?